When discussing digital social networks, the discussion easily circles around Facebook, Twitter, LinkedIn and, more recently, Pinterest. It comes pretty naturally. They are all public and visible for all. Social tools within organizations – often called Social Intranets or Collaboration tools – don’t make it as easily into the discussion. They are not in plain view, hidden behind firewalls full of information that companies and organizations naturally are unwilling to let loose externally. The happier was I recently when I laid my hands on the chart below, as it shows that only Facebook reached the first million users faster than one of the leading social intranet platforms – IBM Connections. 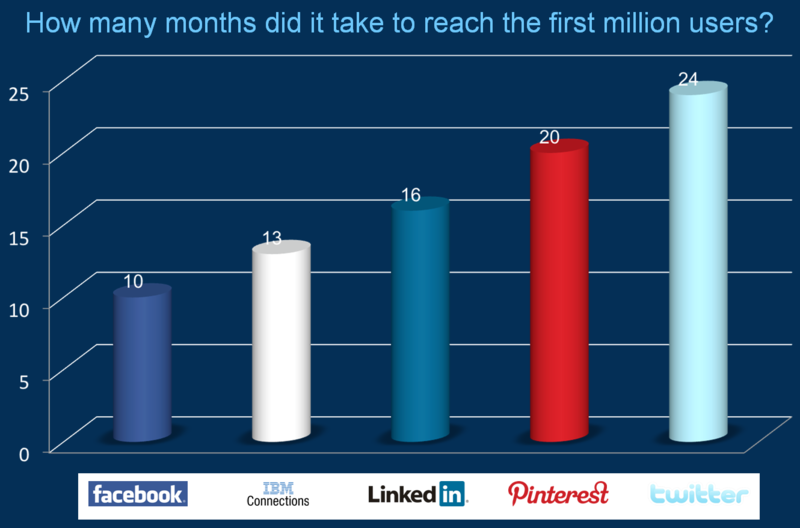 LinkedIn, Pinterest and Twitter needed considerably more months to reach their first million users. The IBM Connections numbers refer to users outside of IBM. The IBM Connections numbers are based on “Authorized users of licenses sold”. I.e. not only licenses sold. Naturally there are factors that prevent direct comparison, but not enough to change that main point of mine. While the decision to use a public social network is taken individually, the implementation of a social intranet is made for you, also which platform to use. Still, it is the individual employee who chooses to make use of it or to keep working the old fashioned way. On the other hand, the decision to join a public social network may well be instantaneous, while a decision on a corporate social network takes a long time and includes financial aspects we don’t need to think of as consumers. But, it does not suffice to just let loose some new software, even if it’s great. Companies, organizations and their employees are creatures of habit, fully busy with dealing with ongoing operations, usually supported (or maybe rather “constrained”) by established processes and policies that safeguard status quo. Capturing the opportunities that come with implementing a social intranet requires executive level commitment and conscious and targeted efforts. But more about that in another post! What’s so disturbing about the new option in Google Search? For a week or so, there’s been hoards of tweets and posts by people being upset about the new feature in Google Search results: the possibility of including search results powered by your network (in Google+, that is). Before looking closer at these to I have to state: the more I’ve read, the more puzzled I have become. What’s so bad about an option to get a little help from your friends by boosting your search results with their experience and activities? After all, they are more likely to share your interests than all the other folks out there. Friendship is usually based on having something in common, isn’t it? In our social intranet, we have similar concept, which we regard as an advantage: “Your friends are your filter”. Faced with an abundance of information, it’s usually a good help to have get a helping hand to find the trees in the forest. Particularly as you really don’t need to be active on Google+ once you have created your network there. Just get an account, add people to your circles and off you go. They don’t even need to accept your following of them like they would have to on Facebook. Topping up, the search results is based on their activity, not yours. So you can just idle and inject their results if you want to. Or not, if you so should choose. Let’s look instead at the “unfair” argument. I thought Google wasn’t a public service, but a business. Just like Facebook, LinkedIn and Twitter are. If the same possibility was available to Facebook, they wouldn’t have thought twice about doing it. And would anybody have been surprised? They are not known for acting like your local charity. Rather, I’ve been hoping for Google as the challenger with both muscle and brains to be able to finally challenge the overwhelming dominance by Facebook on the social arena. Facebook getting some serious competition is a good thing. Also, as stated earlier, once you’ve opened an account and added some folks to your circles your ready to roll…and can keep interacting with your friends on Facebook if you’d like to. Their argument is that adding “your world” to the search criteria distorts the search results compared to the ones generated by the pure search algorithm. Apart from the ability to turn off the “your world”-option, I’ve had more sympathy for this argument. Many of us still remember how sponsored search ranking caused the downfall of Alta Vista (had to search my memory for the name actually). It would be stupid by Google to fall into the same trap. But are they? The network results are clearly indicated as such and the sponsorship is unpaid, made by people by your choice. And… once again… you can easily turn it off. Finally, just a couple of days ago, I came upon the final nail in the coffin of the fundamentalist way of thinking, a blog entry in C-net “Why Google is ditching search“. It brought to my attention what I already knew, but hadn’t thought off: that search results rankings are already distorted, but not through Google selling ranking, but through people engaging SEO services. So, case closed – at least in my book. I will keep using the Search and your world option most of the time and now have one more reason to add interesting people to my circles weather we know each other or not, as long as they seem to post interesting stuff. Author TheSocialSwedePosted on January 17, 2012 Categories Personal Networking & Sharing, Social Marketing & ServicingTags cnet, english, facebook, google+, linkedin, search, twitterLeave a comment on What’s so disturbing about the new option in Google Search?